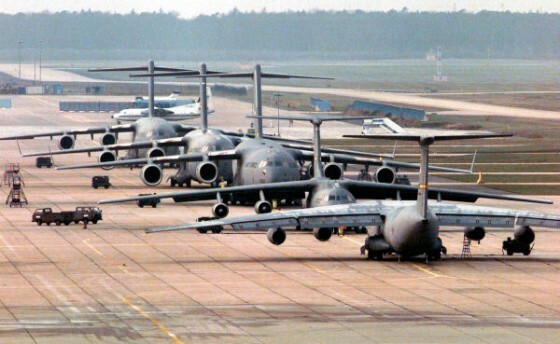 The U.S. Air Force shipped 22,395 tons of tanks, artillery, ammunition, and supplies to Israel aboard C-141 Starlifters and C-5 Galaxies during the 1973 Yom Kippur War. After the first week of battle in the 1973 Yom Kippur War, it was clear to many observers that Israel was encountering unexpectedly high casualty counts and equipment loss in its war with Syria and Egypt. On the Egyptian front in particular, Israeli losses continued to climb as a result of the neutralization of its air superiority by Egyptian surface to air missiles (SAMs). By October 9th, the Israelis had lost 49 airplanes (14 Phantoms) and 500 tanks (400 on the Egyptian front alone). The war of attrition was certainly raising questions about Israel’s military sustainability. For Washington’s peace efforts to succeed, neither side in the conflict could gain anymore militarily than they came into the conflict with. The Nixon Administration needed both parties to enter into negotiations without the balance of military power tilting to either side so as to ensure that both Israel and the Arab states could negotiate on equal footing. Several days into the war, Washington decided that supplementary action needed to be taken to ensure that the balance of the war didn’t tilt in Egypt’s and Syria’s favor, but rather, that Israel would be able to hold its own in battle for at least one or two weeks longer. By the morning of October 9th, evidence strongly suggested that the Soviets were supplying Arab forces with military material and that Moscow had supposedly encouraged other Arab states (i.e. Saudi Arabia, Iraq, Qatar, Kuwait, Algeria, Morocco, etc.) to join the war. With the Soviet Union supplying aid to Egypt and Syria, the U.S. was gifted with diplomatic cover to legitimize an arms shipments operation of its own to Israel. At first, the airlifted shipments were sent covertly via aircraft from El Al airlines, which had had the Stars of David on their tails painted over. These earlier shipments were mostly consumables and light military materials. By October 9th the situation had become so grave that the White House and the Department of Defense decided that the only effective way to supply the Israeli forces with a sufficient number of arms was by direct U.S. military transport aid. An overt military-supported airlift brought with it two major externalities which the White House knew would be the price of such an operation: (1) that the other non-involved Arab countries in OPEC would initiate an oil embargo on the U.S. and, (2) that virtually all European countries were opposed to allowing the U.S. to use their airfields to refuel for fear of having similar embargos enacted on themselves. Secretary of State Henry Kissinger addresses the concerns of NATO countries regarding the Middle East Conflict and affirms the U.S. position. This provided the U.S. military with a major logistic hurdle. But before it was too late, the U.S. was able to convince the Portuguese government to allow the use of an airfield in the Azores and secured Dutch authorization to secretly use an airfield in the Netherlands; a unilateral action by the Dutch defense minister who never consulted his cabinet colleagues on the matter. By the evening of the 9th of October, President Nixon ordered the commencement of Operation Nickel Grass, the American airlift to resupply the Israelis of military equipment lost in the war. Supplies began arriving in droves by October 14th and Israel was able to swiftly reconcile for its earlier losses. A real significance of the airlift was that it guaranteed that the U.S. would retain its influence with the Israeli government, sending the Jewish state help in her hour of need. This was essential to the Administration because by ensuring Israeli faith in the United States, the administration knew that it stood a much better chance of using its influence to make the Israeli negotiating position more flexible in post-war peace negotiations. Secretary of State Henry Kissinger provides diplomatic ammunition to U.S. embassies around the world, explaining U.S. position during the 1973 Yom Kippur War. • By the end of Operation Nickel Grass, the U.S. shipped 22,395 tons of material to Israel, with 8,755 tons arriving before the end of the war. • American aircraft flew approximately 570 missions throughout the duration of the airlift. • El Al aircraft flew approximately 5,500 tons of material over 170 flights. • The airlift continued until November 14, 1973, 20 days after the ceasefire.